These pics were taken a year ago by my friend of 20 years who went for a walk. The Sumner Fire Dept. was burning an old house that had been sitting empty for many months. The fire dept had adjoining streets blocked off as you can see in the pics. 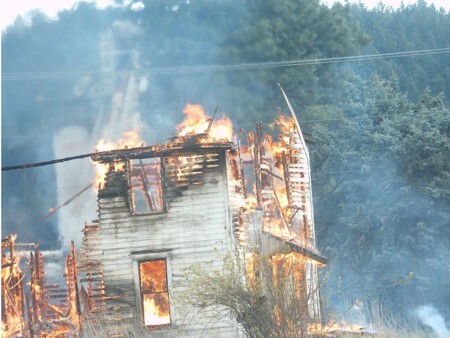 Linda had her camera with her and she took two shots of the burning house. Not sure which picture was taken first and would've sent both but didn't know how so I only sent the one showing the ghosts. She did not see anyone close to the house. It does not seem likely that the firemen saw the woman and child either although they would've been straight across from them. It looks to me like the woman and child are inside the cone meaning closer to the house and not the road. 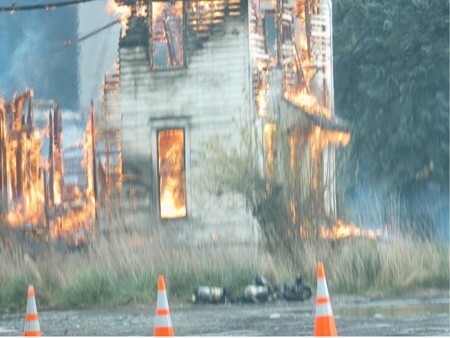 Linda says that the 'ghosts' are looking straight ahead which is where the firemen were standing. I hope you have a good picture editor, to zoom in and change the hues etc because it appears the woman's elbow area is transparent. Interesting. I wonder if they lived there at one time. The woman's elbow is transparent. The ghosts may have been sad to see their house burn in this controlled burn. What is more interesting is that the firefighters at this burn left their Scott air packs so close to the fire!!! Just a ghost hunter and retired firefighter's observations. Where is the ghost at in this pic. Entities often times choose abandoned homes to 'lurk' in. They take on many forms 'familiar spirits'. This entity I'm sure has found another place to 'lurk'. Probably the best photo of two apparitions I've ever seen. My family and I are just getting into the paranormal... That is to say to prove that their spirits are as real as the people that lived there lives. I have always known there were loved ones watching over those left behind, or that there are those that have past and were not ready. We are very respectful not to step on or walk across graves nor are we at any point loud and distasteful. This cemetery has been around since the early 1800's and we had heard several stories of (feelings of being watched, feelings of being unwanted, also sightings of orbs and an apparition or two). My name is Mindy and we were there from about mid-night to 3:30 am we never felt, or saw anything. We heard a baby crying but EVP did not pick it up. We still took many pictures. While we were leaving we noticed that we had captured several orbs. Upon looking closer to the pictures we took, we later realized we didn't see something that definitely saw us. 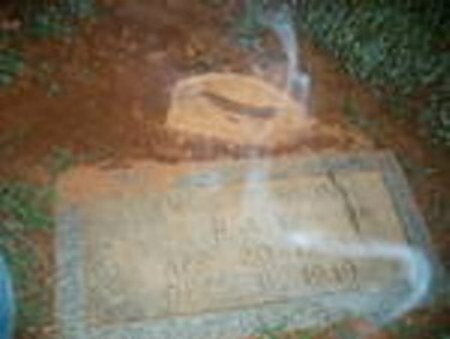 We think it is a woman but it was over the grave of a man. She wanted us to know she was there, or we would have never gotten the beautiful image. Keep 'looking' for them ghosts and they will find you too! You may find yourself taking one home with you!. Exactly. You may take something home with you but I doubt it will be beautiful. Should heed that warning. Speaking from someone who has been there. Sometimes what looks beautiful is not at all pleasant. I also live in Dayton and have an interest in the paranormal. Where is the cemetery located in Dayton? I would love the opportunity to investigate and see if my husband and I can record some proof of existence beyond what we normally see. You want to see true photos of a spirit go to my facebook page you'll see what I can get in daylight.